During a meeting of the Estacada Chamber of Commerce, Mayor Sean Drinkwine noted that he and other leaders are striving to encourage more citizens to become involved with the city. 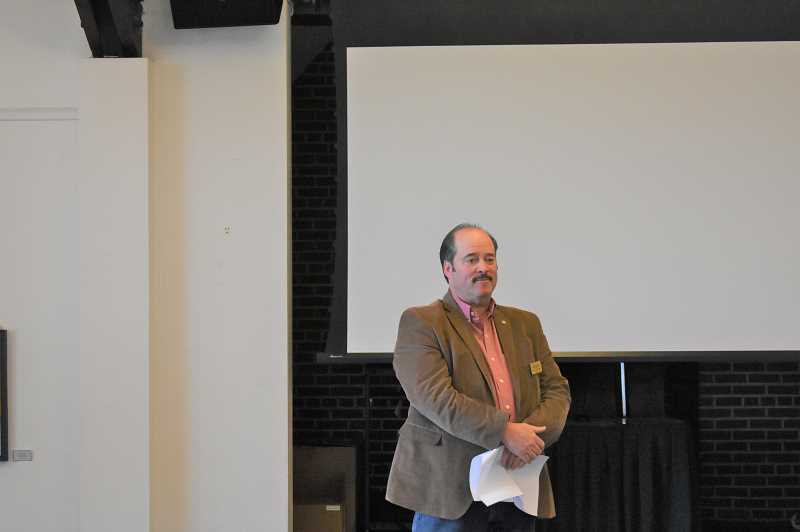 "We're trying to reach out and give opportunities to keep track of the city and all of the things that are happening," Drinkwine said at a Chamber of Commerce lunch on Thursday, March 21. The city has recently implemented a recurring coffee with councilors event to give Estacada residents the opportunity to connect with elected officials in a laid back environment. "It's a chance to speak with the council and find out all of the new things on a casual basis," Drinkwine said, also noting that the city will host a picnic in May. Drinkwine praised the city council, including new councilors Katy Dunsmuir and Jerry Tenbush. "They're very good. They're very invested," he said. He also spoke highly of council President Aaron Gant, who is stepping down from the group because he is moving to Oregon City. "That's a hard loss for me. He keeps me on track, and in the right direction," Drinkwine said. Along with engaging citizens, Drinkwine also discussed the importance of ensuring that Estacada plays a role in the county's conversation about transportation. "We need to make sure that Estacada's name is out there to get a new transportation route," he said, noting that the Carver curves along Highway 224 often suffer from landslides. "They've got transportation dollars. We want to be sure they spend some of it here." Drinkwine noted that the city is pursuing a variety of parks projects, including Wade Creek Park phase three, which will bring enhancements to the area behind the Estacada Public Library. Additionally, the city received a $75,000 grant from Clackamas County Tourism Development Commission for design services on the future riverfront park along the Clackamas River. He also noted that, like many cities, Estacada has been experiencing difficulty with the homeless. "We're having an issue that's happening everywhere," he said, adding that he is interested in potentially forming a coalition about the matter. "We need to grow in a responsible way with the homeless issue." Drinkwine, elected mayor in 2016, looks forward to continuing to serve the city. "Estacada is a wonderful place with many possibilities. I'm working diligently to make those possibilities happen," he said.